When we consider all the films that have come out of the Hong Kong film industry in the last twenty years or so, it is too often with a limited scope. The breadth and range of subjects explored within the Hong Kong Action genre not only break almost all Hollywood, or anyone's, action film standards, but also very well define this genre and keep these films connected. It is not merely a geographical locus which maintains the internal stability of this durable trend in filmmaking. Though broad in scope, Hong Kong Action has a distinctive aesthetic, which both defines its best subjects as well as defines their treatment. There are few forces which could hold together such seemingly disparate types of films as occur in the Hong Kong Action genre. There are the Kung Fu films, of course, but never think they are the standard, or are standard in any way. Tell Michelle Yeoh in Wing Chun or Jet Li in The New Legend of Shaolin that they're doing the same old Kung-Fu routine. Then the ghost story films need to be addressed. But how? Edgar Allen Poe had nothing to do with the Hong Konger's idea of a ghost. Not only are they attractive females, in general, who are pursued to their misfortune by living males, but also there is usually some great demon lord who needs to be overthrown. I never knew a dead girl could be in so much danger. And, of course, there are the cop and gangster films. These are the cops who jump through panes of glass, firing two handguns, to get the bad guy. And the gangsters that rule Hong Kong would have iced the Godfather while he was still mumbling something about sleeping with the fishes. Nevertheless, this does not say what makes these films distinctively Hong Kong martial arts, cop or ghost stories. One thing that does is the pervasive slapstick humor which occurs in (too) many of these films. It is a hard pill for the Hollywood-trained eye to swallow, these bizarre interruptions of bathroom humor and cheap sexual innuendo into an otherwise mature and dramatically involving film. I'm never sure what to make of these moments, other than to assume there must be some significant cultural difference I'm not hip to. The best I can say is that they make for points of intense incredulity in some otherwise serious-minded movies. 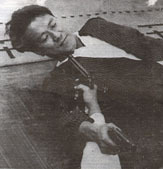 The spectacular occurrence of violence in Hong Kong Action films marks them as different from any other violent films. I think of the first time I saw Zu: Warriors from the Magic Mountain. I'd been gleefully bouncing along to the slash of swords and bloodless spinning of fallen enemies. Then, out of the blue, the main bad guy's head was severed from his body, producing copious amounts of blood. The head was stopped from its flight by being impaled on a branch of a tree. Mind you I was watching this here in the store. When the impaled head began talking, I stopped the tape from offending any more customers. It had to have been a spinning, flying severed head, though, because in Hong Kong Action, if it doesn't do acrobatics, then it's not worth putting on film. More encompassing than any type of story, any humor, or even acts of violence, is the role of acrobatics in the Hong Kong genre. Slow-motion, gliding movement is really what it's all about. Or fast-paced, rapid cut editing, with a twirling, kicking Jackie Chan that can hardly be kept up with. Always is the human form analysed, exploited, and displayed as hyper-kinetic. An interesting thing to note, given this tendency for extreme physicality in these films, is that the human form is not only under constant scrutiny, but it is the body (and its capabilities) which is, in fact, the main star in these films. All mise-en-scene and editing serves and analyses the dynamics of the body in action. Of course this is more or less true of most movies made, yet none more than the Hong Kong film. Enabled by the power of unparalleled editing (in the films of John Woo, e.g. ), blitzkrieg choreography (by directors Tsui Hark, Ching Sui Tung, et al. ), or just genuine super-human training (as in the case of martial arts star Jackie Chan) the human form becomes the center of the universe. All else, all the material world, becomes malleable under the physical force of the body. This might help explain the prevalence of the supernatural in Hong Kong cinema. If one's body is the most powerful thing around, the governing laws of the world lose their meaning. Eventually, anyone can do anything in these films. Through elevating the ultimate dynamism of the human being, Hong Kong Action films provide the context for ghosts and demons to emerge with equally dramatic importance as the living. It means martial arts training can lead into magical powers and spell-casting abilities. And the cops and gangsters are not exempt from these super-human capabilities. In Hard Boiled, Chow Yun Fat's superior says of him "Give the man a gun and he's superman. Give him two and he's God." I'd have to agree. This distinctive combination of elements, techniques, and traditions makes for a cinema of the grandiose, of high drama, of extremes and excesses. It is Wagnerian in its epic proportions, and rarely if ever lets down. This is a world of the possible, where, if it hasn't been done yet, it hasn't been tried. There's nothing else like it, and it gives no signs of diminishing anytime soon. Call it Hong Kong Action. This spotlight was written by Daniel Herbert - ALPHAVILLE VIDEO's resident expert on Hong Kong Action. Next spotlight: A look at Favorite Foreign Films.